Total organic carbon or short TOC is one of the most important sum parameters for assessing the organic load of water. Compared to the more time-consuming methods of measuring COD or BOD, the TOC methode is far more accurate and faster. 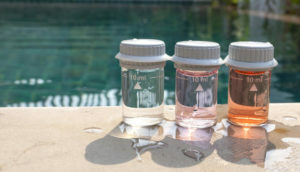 The total organic carbon is used for testing the water quality. For this a sample from the water is taken to measure the TOC. This sample is oxidized in a reactor. This happens at temperatures of 1000°C and above. During this combustion of the water sample the organic carbon becomes CO2. The CO2 concentration can be determined quickly and reliably using sensors. The TOC is expressed in mg/l. Modern TOC Analyzer have automatized the whole testing process. From taking the water sample. Performing the oxidation and finally analyze the CO2 concentration. A good analyzer needs only a few minutes. From taking the sample until producing a result. Using such automized methods, a continues monitoring of e.g. the quality of drinking water or process water can be achieved. This allows a complete monitoring of a production to be carried out.